One of the toughest measures of the stability for a geomembrane seam is Dead Load Testing, which is found in the Standard Test Methods for Coated Fabrics (ASTM D751 Section 80-83).This ASTM standard applies to coated fabrics only, not reinforced laminates, extruded, or blown film geomembranes. Why is this testing only applicable to coated fabrics? The answer is simple: only a heavily reinforced material will perform in a dead load situation. A dead load is a sustained loading rather than instantaneous.The Dead Load Test is derived from the architectural fabric industry where the strength of a structure is achieved through shear loading. In that application, a membrane is loaded in tension between supports and responsible for shedding precipitation while holding snow and wind loads. 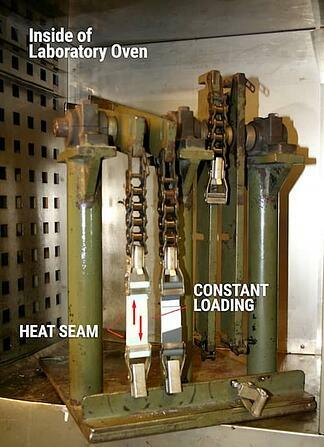 Seams are loaded in shear, continuously. Note: In this picture, loading is biaxial along the structure. The test itself utilizes a constant load across a seam. One option is to perform the test at elevated temperature, inside an oven, to simulate an outdoor environment as shown below in the laboratory oven apparatus. Note that in the lab the load is applied via a cantilevered arm delivering the desired load via a moment arm calculation. Exposed geomembranes on slopes may have seams perpendicular to the slope. All exposed geomembranes are subject to ambient high temperatures and UV-induced high temperatures. Seams which are parallel to the slope also have lateral loads. Covered geomembranes have overburden-induced stresses and geomembrane installation requires significant stresses, often resulting in sustained loading on the seams. Non-reinforced geomembranes are often constructed entirely in the field, resulting in added induced stresses over the life of the installation. Dead load resistance testing does not apply here because these materials will simply stretch and not carry load. Redundant, load-bearing layers are often placed over low dead load strength geomembranes to compensate for the load-bearing layers, adding cost and complexity to the project. The high temperature dead load test, which most closely evaluates the heat seam relative to the strength of the parent material, eliminates the “weakest link” concern. Dead Load Seam Testing is an effective way to evaluate both the seam and the parent geomembrane material for long term stability. What is your experience with Dead Load Seam Testing? Tell us about it in the comments!